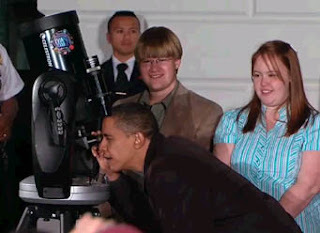 On a recent evening on the White House South Lawn, President Obama, wife Michelle, and a group of about 150 middle-school students looked toward the heavens for some stargazing fun. The star party was eight months in planning and had many luminaries on hand, including former and current astronauts Buzz Aldrin, Sally Ride, John Grunsfeld, and Mae Jamieson; presidential science advisor John Holdren; and NASA administrator Charles Bolden. In his remarks to the students, the president challenged those in attendance to strive for greatness, “What will your great discovery be?” he asked. “Galileo changed the world when he pointed his telescope to the sky. Now it’s your turn.” I am pleased to learn that President Obama is pressing for dramatic improvement in the quality of U.S. mathematics and science education. This is a refreshing change in encouragement for our nation’s young people. You can view President Obama’s opening statement by clicking here and check out some of the stargazing, the Double-Double in Lyra through the Celestron CPC 800 8” SCT telescope used for the star party. The proceedings were broadcast on NASA TV. The photo attached to this post pictures two exceptional teenagers, 14 year-old Caroline Moore who last year became the youngest person to discover a supernova, and high-school sophomore Lucas Bolyard who discovered a pulsar in archived radio telescope observations. What a superb head start these youngsters have in making a serious contribution to the field of astronomy. As a 4th grade teacher, I've been waiting a very long time to hear that the government wants to encourage kids in math and science. I hope it continues. This is the man who made campaign promises to shelve our manned space exploration program. I find it difficult to believe that anyone who sincerely considers science, math, or education to be priorities would propose such a pronounced step backwards.